Service AreaWe are available for landscaping, sprinkler repair and installation, and grounds maintenance services in Boulder County and surrounding areas. Your lawn is a living thing. It requires care and attention to stay healthy and growing. In the first season, mow frequently to stimulate new growth, which will result in a very thick carpet of turf. Following the initial phase, mow as your needs require. Mowing height should be 2-1/2” to 3”, an optimal height for drought tolerance. Keep this height the same throughout the year to encourage growth. The mower blade should be kept very sharp to cut the leaf blade cleanly. A dull mower will shred and fray the leaf blades, resulting in a brown-colored, unattractive lawn. When leaf tissue is not “torn” it retains more moisture content, contributing even more to your lawn’s drought tolerance. When mowed, your grass will have reduced carbohydrate production and shading of lower leaves. This loss can be damaging to your lawn, but can be avoided by never removing more than 1/3 of your grass’ green tissue in any one mowing. When grass clippings are removed from your lawn after mowing, nutrient needs are greater. That’s why we commonly recommend mowing more frequently and letting clippings remain in your yard. Grass clippings decompose quickly and contain an estimated 4% nitrogen that will return to the grass plant, provided the need nutrients. Grass clippings left in your lawn in general do not contribute to your lawn’s thatch. Of course, too much thatch can be damaging to your turf and yard. Too thick of a layer will not allow moisture or grass roots to reach the soil under the thatch, resulting in a shallow-rooted, and often nutrient-deficient, lawn. The most effective way to control thatch is with a healthy earthworm population. These nightcrawlers ingest dead plant material, dilute vegetation, and tunnel extensively in the soil. When earthworms are present, there is less need for mechanical verticutting and aerifying of your lawn, as their tunnels have the same effects as these treatments. (If you need to aerate, do so in the fall rather than the spring and conduct core aeration of ¾” plugs, this is also a good time to fertilize). be ready for its first mowing. Mow when grass is dry. Be sure your mower blade is sharp. Mow frequently enough so that you remove no more that 1/3 of the height at a time. Allow grass clippings to remain in place to add nutrients and improve turfgrass. 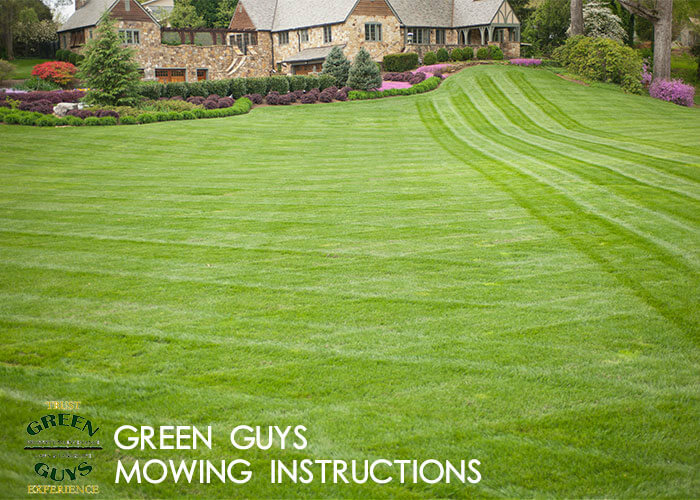 Download Green Guys Mowing Instructions here! How Much Water Is In Snow? Providing excellent lawn care and landscaping services to Longmont, Boulder County, and surrounding communities. Ready to Work With Green Guys? © 2019 Green Guys Property Maintenance, Lawn, and Landscape - (303) 775-7412| Site by DogCat. and Your Home For The Warmer Weather!